HERZLIYA, Israel (AP) — Thousands of African asylum seekers on Wednesday protested outside the Rwandan Embassy in Israel, calling on the African country not to cooperate with an Israeli plan to deport them. President Donald Trump plans to meet with world leaders, dine with business executives and declare America "open for business" during his trip to the Davos summit. KAMPALA, Uganda (AP) — A government-controlled newspaper in Uganda says 45 Rwandan nationals have been charged with terrorism and establishing a terror organization. The New Vision reported Friday that the suspects were charged Thursday in a remote town in western Uganda. The report gives few details about the charges. Ugandan police and a judiciary spokesman did not respond to requests for comment. KAMPALA, Uganda (AP) — Ugandan police are holding eight media workers on treason and other charges for a report saying Uganda is planning to overthrow the president of neighboring Rwanda. Police spokesman Emilian Kayima says the employees of local tabloid The Red Pepper are in detention pending confirmation of charges by the prosecutor. The suspects include five managers and three editors. KIGALI, Rwanda (AP) — A Rwandan court has denied bail to a critic of President Paul Kagame. A court in the capital Kigali ruled Monday that Diane Rwigara should not be freed during her trial, saying the charges of forgery and inciting insurrection are serious. Rwigara, who has been in detention since September, insists she has been targeted after criticizing Rwanda's long-time leader. KIGALI, Rwanda (AP) — A jailed critic of Rwanda's government said Monday she was detained because she tried to run against longtime President Paul Kagame in the recent election. Diane Rwigara, who faces charges of inciting insurrection against the state and forgery, spoke out in a courtroom in the capital, Kigali. She said she was charged "because I spoke about crimes committed by this government. Nobody has talked about Rwandans who disappear without a trace." KIGALI, Rwanda (AP) — Former Rwanda presidential candidate Diane Rwigara is denying charges of insurrection and forgery that she says are linked to her criticism of the government's human rights record. Rwigara appeared in court Wednesday in the capital, Kigali. She and some family members were detained late last month. Her mother, Adeline, and sister Anne have been charged with incitement and "discrimination and sectarianism." KIGALI, Rwanda (AP) — Rwandan prosecutors on Tuesday charged a prominent critic of the long-time president with forgery and inciting insurrection against the state. Diane Rwigara faces up to 15 years in jail if she is convicted of the more serious offense of inciting insurrection. KIGALI, Rwanda (AP) — Rwandan police have arrested Diane Rwigara, a leading critic of Rwandan President Paul Kagame and a women's rights activist, for alleged offenses against state security. Rwigara's mother and sister were also detained on the tax evasion charges and she is also being charged with forgery, Rwanda police said in a Twitter post Sunday. The three who arrested Saturday have been under investigation and police have interrogated them several times. KIGALI, Rwanda — Diane Rwigara, a leading critic of Rwandan President Paul Kagame, was arrested on charges of tax evasion and forgery. Rwandan police also posted a message on Twitter saying Rwigara and members of her family were held for not responding to summons and were later released. KIGALI, Rwanda (AP) — The brother of a former presidential hopeful in Rwanda says Diane Rwigara has been arrested again in the capital. Aristide Rwigara, who lives in the United States, says his sister was taken from their Kigali home Friday along with their mother, Adeline, and sister Anne. Rwandan police have not confirmed the arrest. Authorities have said Diane Rwigara is under investigation for tax evasion and forgery. She was briefly arrested late last month. KIGALI, Rwanda (AP) — Rwandan police say they are questioning a former presidential hopeful who is suspected of forgery and tax evasion. Police spokesman Theos Badege says officers forced their way into the home of Diane Rwigara after they were denied entry. Badege says she failed to respond to three summonses. Rwigara could not immediately be reached for comment Monday. KIGALI, Rwanda (AP) — A women's rights activist and former presidential hopeful is in police custody in Rwanda, her brother said Thursday, raising concerns about the whereabouts of a rare challenger to longtime President Paul Kagame. KIGALI, Rwanda (AP) — A former presidential candidate in Rwanda is under investigation for forgery and tax evasion, police said Wednesday, a day after detectives searched her home in the capital, Kigali. Diane Rwigara is being investigated on suspicion of forging signatures during her efforts to qualify as a candidate, police spokesman Theos Badege said. Police and revenue officials also are investigating her family's business over allegations of tax evasion, he said. KIGALI, Rwanda (AP) — Rwandan President Paul Kagame was sworn in for a third term Friday after winning re-election with nearly 99 percent of the vote. Many African leaders attended the ceremony in the capital, Kigali. The longtime president had described the Aug. 4 election as "a formality" while campaigning. KAMPALA, Uganda (AP) — A Rwandan refugee has been kidnapped by unknown people in Uganda, the victim's wife and Ugandan officials said Thursday. Rene Rutagungira was known to refugee officials before his abduction in the capital, Kampala, said Apollo Kazungu, a government commissioner in charge of refugees. Rutagungira had been out drinking with three Rwandan friends when he was kidnapped late Saturday, said his wife, Jasinta Dusangeyezu. The United States says it is "disturbed by irregularities observed during voting" in Rwanda's election in which longtime President Paul Kagame won with nearly 99 percent of the vote. 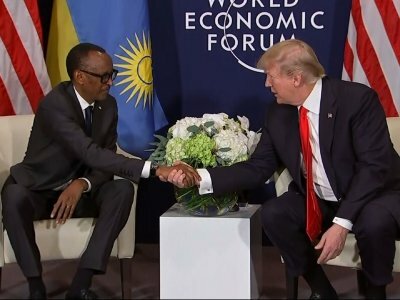 KIGALI, Rwanda (AP) — The United States said Saturday it was "disturbed by irregularities observed during voting" in Rwanda's election, which longtime President Paul Kagame won with nearly 99 percent of the vote. A State Department statement reiterated "long-standing concerns over the integrity of the vote-tabulation process." KIGALI, Rwanda (AP) — Rwanda's long-time president has 99 percent support with nearly half the ballots counted in Friday's presidential election, according to preliminary results from a vote he was widely expected to win. President Paul Kagame, who has led Rwanda since his rebels ended the 1994 genocide that left more than 800,000 people dead, told a campaign rally in July that "the day of the presidential elections will just be a formality." With 40 percent of the polls reporting, President Paul Kagame is leading Rwanda's presidential election with over 99 percent of the vote. Neither of his challengers — Frank Habineza and Philippe Mpayimana — has reached the 1 percent mark so far, according to preliminary results announced by the electoral commission Friday night. Kagame won 93 percent of the vote in the 2010 presidential election. KIGALI, Rwanda (AP) — Rwandans living outside the country started voting Thursday, a day before the presidential election that longtime leader Paul Kagame is widely expected to win. The electoral commission for the East African nation said more than 44,000 people in the diaspora were expected to vote at nearly 100 polling stations. Political analysts called that a small part of the millions of Rwandans living overseas. Rwanda's 6.9 million registered voters can vote on Friday. KIGALI, Rwanda (AP) — In the eyes of some voters Philippe Mpayimana, a fresh-faced former journalist who is running for president of Rwanda, is just a clown. Otherwise, they ask, why would he be running against longtime President Paul Kagame? Some of Mpayimana's campaign venues are nearly empty of people, underscoring a widespread belief among Rwandans that Friday's election is just another coronation for Kagame, who won 93 percent of the votes in the last election.